Popular in the 1980s, the Rubik’s Cube is making a comeback, especially among juniors at Pace Academy. Many consider the cube just a simple childhood toy, something they’ve never really thought about. However, the junior class is on the road to mastering the 3-D puzzle. Aside from being fun and challenging, Rubik’s Cubes give relief to students who appreciate having something to play with in class. “Rubik’s Cubes help calm my anxiety,” said junior Kylie Blank. “They are an outlet for me to steady my mind.” The combination of the multiple colors and having something to fidget with is appealing to many students. “It’s nice to have something to do with my hands to keep me focused in class,” said Hill. 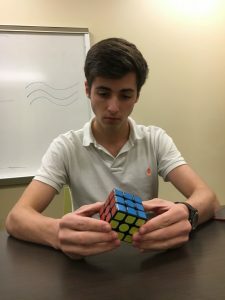 “It occupies my brain and hand-eye coordination.” Others enjoy the feeling of accomplishment the cube provides. “It helps me in math class because it makes me feel connected to the school atmosphere,” said junior Henry Todd.